In addition to being registered with Investors in People, Nobisco takes its wider social responsibilities very seriously. To this end Nobisco is registered with SEDEX, the Suppliers Ethical Data Exchange (www.sedex.org.uk). Sedex enables suppliers to maintain and share data on labour practices in the wider supply chain. 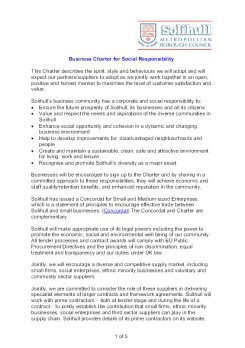 Nobisco is also committed to the Solihull MBC Business Charter for Social Responsibility. Copies of the Solihull Business Charter can be downloaded from the link below. Copies of our IIP certificate can be downloaded from the link below.